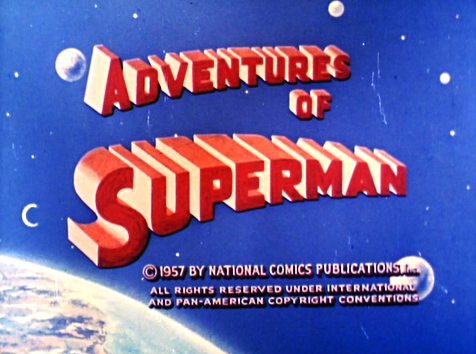 The introductory montage to Adventures of Superman (1951 - 1958) is elegant simplicity. This introduction is concise, vivid, and blunt. In short, it transmits to the audience absolutely everything it needs to know about the superhero series in order to enjoy an episode. The introduction opens with an adventurous title card (above), and then we get the perfect conjunction of voice-over and imagery. What we see is, simultaneously, what we are told. First, we get acquainted with Superman's amazing capabilities. 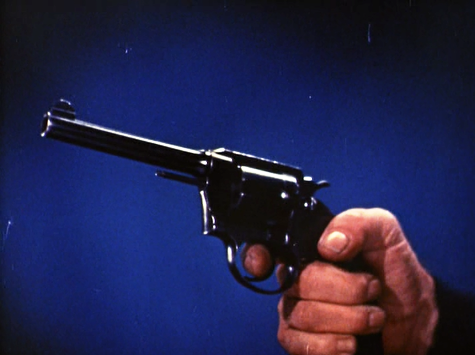 He is "faster than a speeding bullet," and the montage cuts to a gun firing. 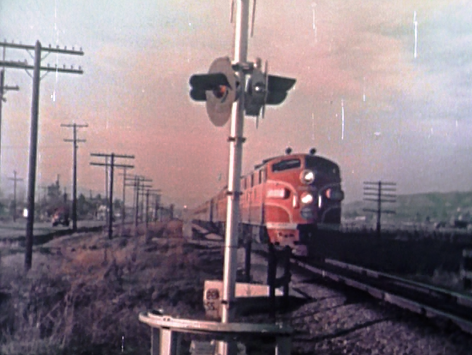 He is "more powerful than a locomotive," and so we see a train racing by on a track. 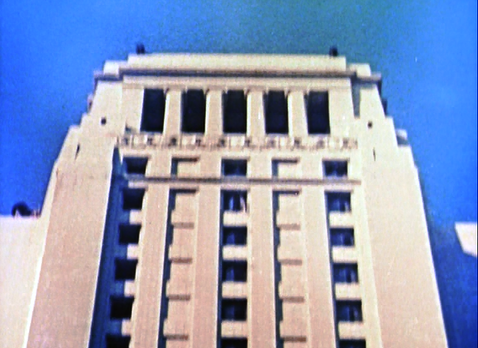 He is able to "leap tall buildings in a single bound," and the camera pans up and up across the exterior of a skyscraper. 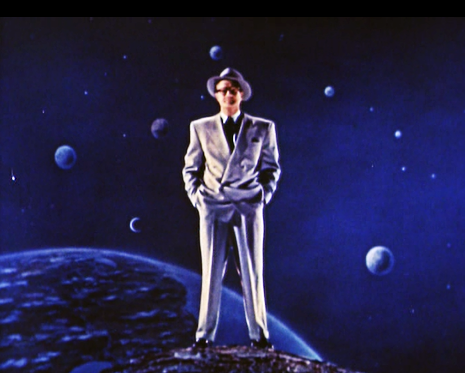 Next, a voice implores us to "look up in the sky." It's a bird! It's a plane! No...it's....Superman. 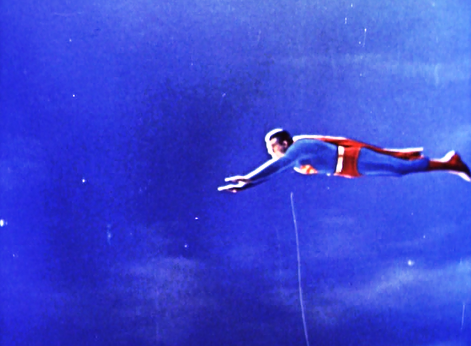 During this interlude, we are treated to the series central (and stock...) special effects footage, of Superman flying through the air. We hear "wind" sound-effects as he travels. The next series of compositions are all the same, modified only by one small change between shots, again proving the montage's economical nature. 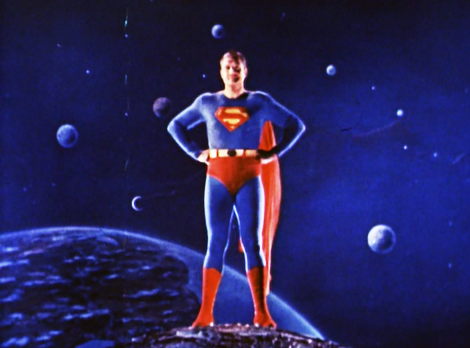 First, we learn that Superman is a "strange visitor from another world" as we see him striding over the Earth in his colorful costume. 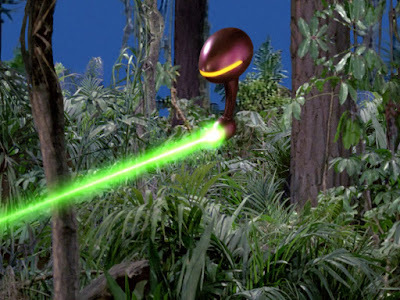 The background of the planet suggests this alien or interplanetary nature. Then, the image shifts. Only Superman changes, as the background remains the same. Now, he is seen in his "disguise" as "Clark Kent, the mild-mannered reporter from a major Metropolitan paper, the Daily Planet. Finally, the image changes again. 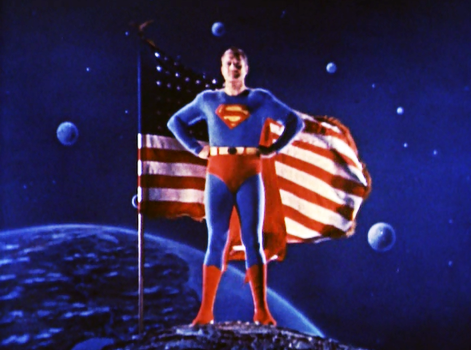 An American flag now appears behind Superman (back in uniform...) when he learn that the hero fights for "Truth, justice, and the American way." The flag appears just as the narrator stress the word "American." In just under a minute then, this colorful and terse montage introduces us to Superman's powers, his origin, his secret identity, and his quest. In short, it's absolutely perfect. There is not a wasted breath, image or sound here, and in some sense, this brevity of detail captures the essential strength of the central character, the Man of Steel. Next week on Outré Intro: Space:1999 Year Two. What I think of when I hear "Never ending battle."